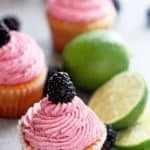 Blackberry Limeade Cupcakes – Homemade limeade flavored cupcakes topped with a sweet and delicious blackberry buttercream. These are perfect for spring and summer entertaining! I’m officially 35 as of June 7th, and I’m not quite sure how I feel about it. What does 35 have in store for me? Who really knows that answer. I do feel more confident and excited about the future so that’s one good thing about turning a new age. I also decided that I want to have a bit more fun and let myself relax. Blogging can become so routine and rigid if you allow it. We bloggers can lose sight of the fun that it used to be. We can start to judge whether something is a success solely based on the numbers: number of likes, number of comments, number of page views, number of followers, numbers, numbers, numbers! It is so exhausting trying to live up to expectations and requirements like that. And to tell you the truth, it isn’t what I signed up for in this biz. I signed up to share my recipes and my family traditions and stories in a way that fulfilled purpose and created some happiness out here in the internet space. To lose sight of that would be to lose sight of me. I decided to get back to the fun of this whole thing. That doesn’t mean I won’t still be striving for greatness and for growth and accomplishment. It just means that I won’t feel like a failure if I don’t meet the arbitrary milestones that I don’t necessary agree with. To celebrate, I made these Blackberry Limeade Cupcakes. I made them because they make me feel good, and I love the flavors. I didn’t decide to share them based on whether they would do well on the site or not because seriously who knows what will do well. I decided to share them because I love them. So I hope you will love them too. Blackberries and lime are such a great pairing if you haven’t tried them together yet. I love the cupcake batter because it has so much lime flavor baked inside. And they are super light, moist and fluffy. Those are the key characteristics to wonderful cupcakes. The buttercream is just how I love it. Sweet, creamy, smooth and such a beautiful color. This may be one of my absolute favorite buttercream recipes because of the blackberry flavor, which you can amp up or tone down based on your preference. It is unlike anything else. Paired with the limeade cupcakes, you have something quite quite special indeed. So try them out if you wish, and if you don’t, just stare at the photos and enjoy. Either way, do whatever you want from a place of authenticity and live by your own rules. You will be seeing more of this attitude around these parts. Sensational Blackberry Limeade Cupcakes- Homemade limeade flavored cupcakes topped with a sweet and delicious blackberry buttercream. These are perfect for Spring and Summer entertaining! Preheat the oven to 350F. Add cupcake liners to muffin pan. In the bowl of your mixer, add butter and sugar and mix on high until well blended and fluffy. Turn down mixer to medium speed and add eggs, one at a time, beating after each addition. Next, turn down mixer to low speed and add in flour, lime zest, baking powder, baking soda and salt. Lastly, add in lime juice, milk and vanilla extract and mix until well blended. Using an ice cream scooper, fill each cupcake liner 3/4 full and bake for 20-22 minutes or until a toothpick inserted in the center of a cupcake comes out clean. Place cupcake pan on cooling rack for 10 minutes. Add the blackberry puree, vanilla extract, and salt and beat until the mixture is puree is fully incorporated. Once the cupcakes have cooled completely, pipe them with the buttercream. Wow these cupcakes sound like a treat, I have to make these this summer! They are super lovely indeed! Thanks for the comment! 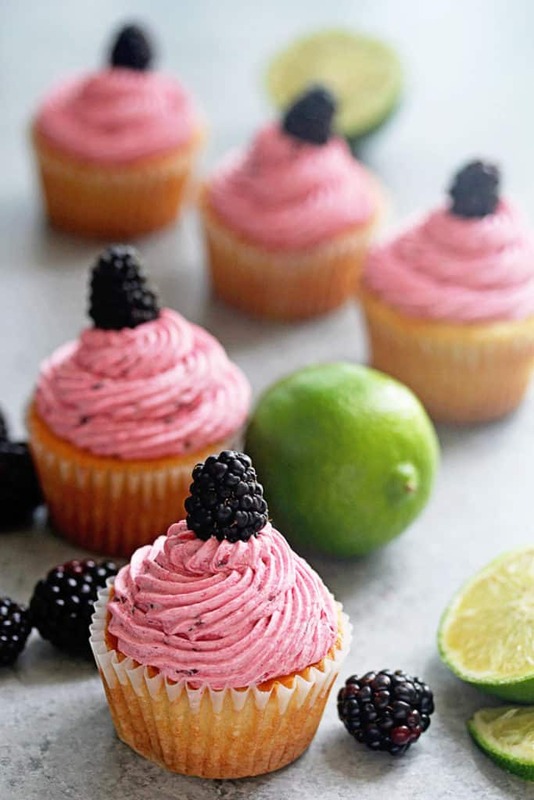 I love sharing good food with friends and family too — and these blackberry limeade cupcakes would be perfect for a picnic!!! I love you insight on this and finally had to give up some of those same things when I started my new job! Be you! I agree boo. We gotta do us. Thank you so so much Sophia! Wow, those look absolutely amazing and I LOVE the blackberry-lime combo! Happy belated, Jocelyn! These are the most beautiful cupcakes. And what an inspiring post to read about staying grounded and passionate about this crazy blogging career. I love everything about your website! You are adorable (hopefully a well-received compliment to a newly 35 year old lady, as opposed to accidentally condescending). I love your style. Your dresses are amazing. Your photography is stunning! I don’t know how to bake, but I can only imagine that your recipes are as fabulous! I’ve just joined all your social media channels so we can be internet friends! Looking forward to checking out more of your posts. Hi Lauren, I am so glad you found me. Thank you so much for following along with me and for the super sweet adorable comment. I truly appreciate it in my newly 35 year old state haha! This is so absolutely the most delightful piece of heaven! Happy belated Birthday, I should have said that first,but the cupcake got the best of me. Sorry! Would this work as a cake, if so would the baking time bet he same? Thank you for have such a blessed soul in sharing all of your wonderful and beautiful tastings of life! Hi Julia, thank you so much. I think you could definitely try this as a cake but it will bake a little longer so maybe 20-25 minutes but I would start checking around 15 minutes just to be sure. Hope you had a wonderful birthday J! 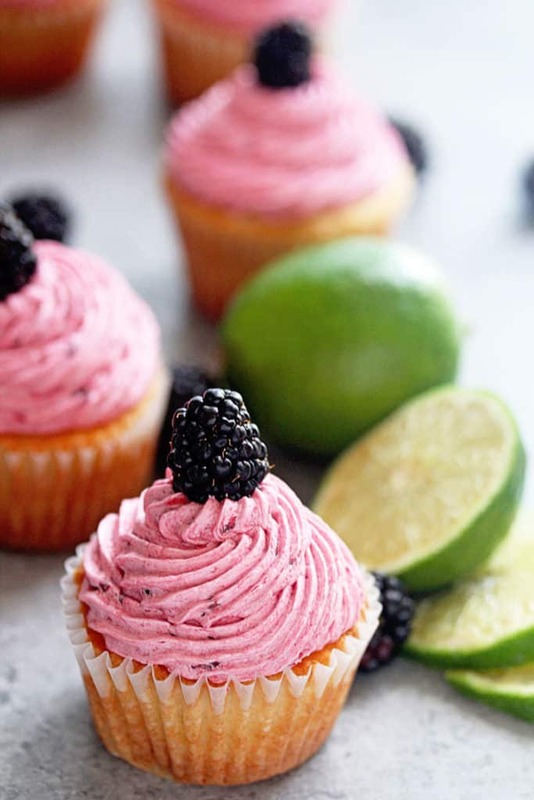 The cupcakes look wonderful, I have to try lime and blackberry is summer… sounds delicious! Yes its a great combo! 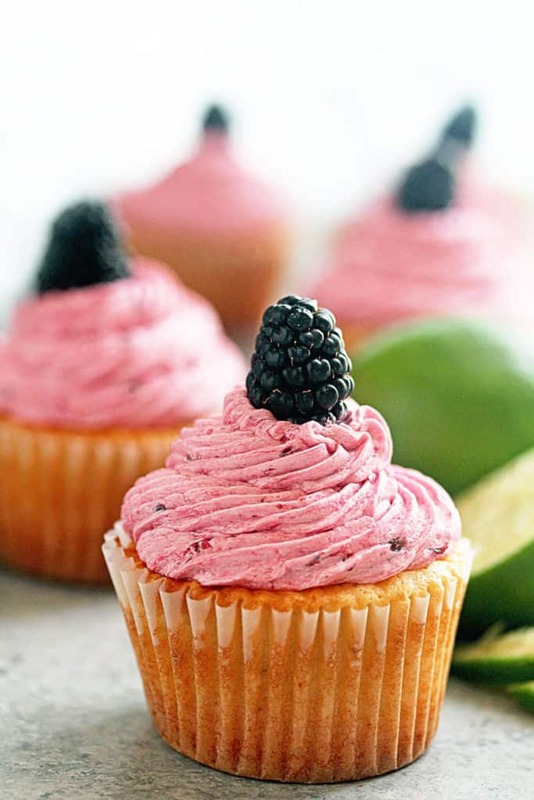 Blackberries and lime go so well together, I make a delicious chia drink that combines them…but I’m loving the idea of them in cupcake form. That frosting is so pretty, too. Happy Birthday! No way you are going to be 35! You look awesome! Blackberries hold a special place in my heart, and combined with cupcakes you have pure decadence! Aww you are the sweetest. I feel 25 so that’s good! Now that’s a great way to look at it! Congrats to you on your one year! Make it all about fun and you will definitely continue blogging. Beautiful cupcakes! Happy Belated Birthday! I celebrated my one-year blogging anniversary in January, and I’ve read how grueling it can be from several bloggers with the numbers game. Continue to show up and have fun; that’s where the real numbers count. 🙂 Make your day AMAZING!! Thank you hon. Its all about fun right? I hope you a wonderful birthday! I’m just a year behind you and will be celebrating 34 next month. But honestly, I stopped counting at 30. You’re only as old as you think you are! These cupcakes look fantastic! I love them! Now that’s a plan. Stop counting all together! Happy belated birthday! I hope 35 is great for you. And pssh… who cares about milestones? I say post when you like, what you like and have fun. 🙂 And these cupcakes are gorgeous! Its all about fun. Thanks hon!